The view of the Portland skyline is stunning. Unfortunately, phone cameras aren't good at capturing stunning views when the sun is shining directly into them, hence the white blob off in the distance. And YAY me for being #1 tonight. I just got back from my trip to Northern CA (missed Matt by a DAY!) and thought I would check in to see where our Hobo was. Deanna- bummer you missed Matt by a day!! thanks for all your insights as to the Portland trails… it’s great he’s had lots of invites so I’m glad he’s taking a leisurely walk through town. Deanna, I am confused. What other pictures? Did I miss downtown? He showed signs on Division Streetl coming into the Metropolitan AREA on the East side. He has come now to Mt. Tabor. He is still on the East side. Has to cross over the Willamette River before being “downtown” Portland. Which by the way, is a very beautiful city. Then he climbs up into the hills to the West side. I wonder what route he will use. I am glad he left the river and is not going across St. John’s Bridge. He must be heading towards Lucky Family No. Two!!!! I bet Matt scared the bejesus out of that lady on the bench. Who would expect a homeless mountain man to sneak up on you while your enjoying a peaceful moment in the park. I would have had to have a little fun and hit her up for some change, rambling incoherently with a crazy look in my eyes. LOL I got an error page coming in …it gave me a clip from midnight cowboy the scene that says “Hey I’m walking here!” lol too funny! that’s what comes up when the site is busy uploading pics from Matt usually…. Hi Tatjanna Miller In Montana! I like your work and especially your black and white stuff. I noticed a lot of the kids had blue eyes. Was that planned for effect or just coincidence? I just can’t believe you’ve gotten this far this quickly! Your pictures have been wonderful; this whole trip of yours is absolutely amazing! Won’t be long now before you see the Pacific! I was thinking the same thing Karin. Have a great walk today Matt, almost there ..
seriously folks?!?!?! only 4 to 5 more days of this? and then cold turkey? ugh! No kidding, Charlie. I added it to open as one of the tabs on my IE home page ages ago and will shed at least a tear when the updates and new photos cease. Still an awesome pic. ALMOST THERE! enjoy I know you are getting excited. Beautiful pics from Mt. Tabor!! Have a good day Matt and be safe! I wonder if Oregonians dream of visiting flatlands. I’ve run across a few in the desert. A wanderer wanders wherever he (or she) is from. In the NW they’re called “snowbirds” — retired folks who flee to warmer flatlands & deserts when the first snow flies, and return when it melts. Here on the east coast we have “snowbirds” as well. They fly south to Florida for the winter and come back when the spring thaw starts! lol. Some even go the desert route and go to Arizona. In TN we have snow birds and now half backs. Halfbacks are those who moved from the Upper Mid West and Northeast to FL. They are not happy in FL now so they move to East TN to be close to the Smoky Mountains and all of the lakes we have. Hence a halfback. Ready set go. It is a halfback pass for a TD-College football starts soon. GO VOLS! Nope! We can’t walk on flat ground. Been walking on hills so long one leg is shorter than the other! Actually just a few miles south of Portland the Willamette valley starts. One of the most fertile farming areas in the country. Flat, flat all the way to Eugene-about 100 miles. You can see the Cascade range to the east and the coast range to the west. We basically have it all in Oregon. Beaches, mountains, high desert. All of it beautiful. What more could you want?! Well with the trip winding down I wonder if Matt has made any discoveries as to what he wants to do with the rest of his life? I am so envious of him that he got to do this trip. I will miss his daily posts. Hope this website stays up. I’ve read good travel books more than once, and I’ll want to take this desktop journey again. Did you get a chance to talk to the woman in the picture? If not, she may never know how close she was to a celebrity. 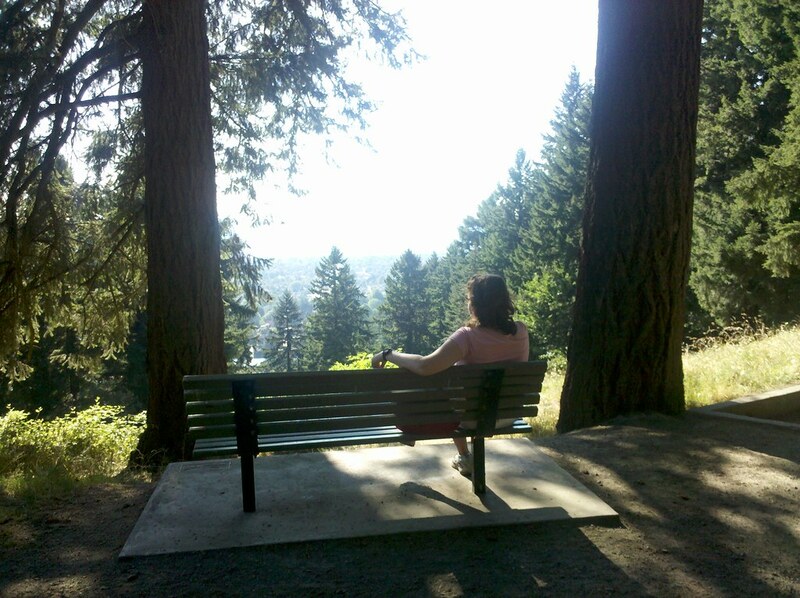 BTW: “Portland’s Mt Tabor, a volcanic cinder cone, was named by Plympton Kelly, son of Oregon City pioneer resident Clinton Kelly, after Mt Tabor in Israel, six miles east of Nazareth.” Can I get an ‘amen’! Portland really is stunning, even with the white blob in the background :-) I hope to visit someday. We were 60 miles from Matt’s path yesterday. I tried to convince my family to take a detour and track Matt down…. but the rest of the family just wanted to “get home”…..hence my infatuation with this walking journey. The ability to see and do things you wouldn’t normally see or do in a car….. I see Rockaway, OR has Matt’s link on their Chamber of Commerce website….he’s almost there!!! I was totally flabbergasted at the amount of STUFF he is carrying in that Mattmobile! I wonder if he has jettisoned any of it by now? Thanks for the thought of “finding Matt”. I’m sure we all wish we could “find” him and give him a big hug! Rockaway Beach has a community bonfire on the beach scheduled for Friday, 8/27, and a street dance for Saturday, 8/28. Sounds like the perfect fun agenda to celebrate Matt’s arrival. MAN!!! That sounds like perfect timing! What a great celebration if Matt arrives about then. Maybe that’s part of the reason he’s lingering a bit in Portland. He would probably arrive at the Coast several days before this event if he kept on chuggin’ at his usual pace. Yes, I e-mailed the Chamber on June 29, 2010 and told them about Matts trek. The person who e-mailed me back was not aware of his trek from one Rockaway to the other. I had a person with the Chamber who called me last week and I told them he would be in Rockaway before the end of the month. I hope I did not step over my bounds but I thought this would be a big deal for Rockaway Beach, OR; after all it is a small place. If my memory is correct less than 2,000 full time residences. The Chamber is not staffed fulltime. If this is not what Matt wanted, I apoligize and ask for forgiveness! Matt, I say you continue on south, back over to the east coast and then northward to home. Instead of walking across, walk the perimeter! 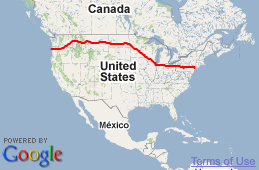 Earlier today I emailed Matt suggesting he head south to Rockaway Beach California, near San Francisco. About 720 miles. Hopefully he will give it serious consideration. What a beautiful place to sit and meditate. The view looks phenomenal even with the sun beam shining into the picture. It’s got to be even more spectacular when the sun goes just a little down around the trees. What a beautiful sight. This is a beautiful place and still a good photograph because we all know it is a spectacular spot or Matt would not have taken the shot! It looks like a great spot for reflection – Oh no another one! A peaceful and reflective spot that is probably used a lot by many people! My husband and I got married on Mt Tabor 15 years ago, I’m very much enjoying all your pictures!